About five years ago, Versus You possibly released for their song You Are My Friend the most beautiful video clip to ever have come from Luxembourg. This year, the band may get another award, this time for the cutest ever cover artwork. The new album Worn And Loved has a picture of the local state bank on the cover, just like on the piggy banks that little kids get in elementary school, except that here, you see a young girl carrying a razor walking towards the bank. Versus You are one of Luxembourg’s most productive bands. Worn And Loved is already the tenth release (six longplayers and four EPs) of one of the most popular bands from here. The punk rockers offer what you expect on their new album. The songs average about two and a half minutes each, with the entire album making it only a little over half an hour. The songs are of course of the highest quality. You can label Versus You either a pop punk or a melodic punk rock band, but their sound is lightyears away from the banality of kiddie punk. The band manages again and again to combine heavy hitting guitar riffs with the necessary harmonic ease. Vocalist / guitarist / songwriter Eric Rosenfeld has a raw yet pleasant voice that one really likes listening to. Sometimes the melodic as well as melancholic songs remind me of Leatherwolf, although it must be said that over the years, Versus You have found their own stylistic identity that makes them unmistakable. There is one track on the album that is rather different. Shared Pillows is definitely more grunge than punk and shows parallels to Nirvana. Even though I really love Versus You’s typical sound, this is nevertheless a pleasant surprise. 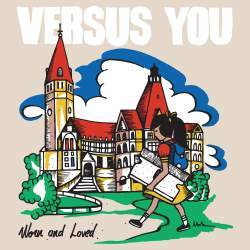 As Versus You have been around for already fourteen years, there is a certain nostalgia when it comes to listening to their music. Somehow the retro cover artwork therefore works especially well with the product. Worn And Loved is once again a really strong record where the band made no mistakes. This record should be in every well-sorted punk collection.